Thirty one digital films in competition, plus more than a hundred in exhibition, new sections, and a second festival venue all make Cinemalaya bigger and better this year. With the tagline in festival ads beckoning audiences to “See the Unseen”, Cinemalaya films this year tackle such themes as passion, memory, truth, despair, obsession, terror and splendor. Cinemalaya will reach a wider audience as it will be held in two places at the same time: its main venue at the Cultural Center of the Philippines, CCP Complex and at Greenbelt 3 in Makati City, in cooperation with Ayala Theaters Management. The addition of Greenbelt 3 as a second major venue for the festival is part of the vision of Cinemalaya organizers to make the Festival more accessible to the growing number of audiences that attend Cinemalaya. Now on its seventh year, Cinemalaya is a project of the Cinemalaya Foundation, Cultural Center of the Philippines (CCP), Film Development Council of the Philippines and Econolink Investments, Inc. It is an all-digital film festival that aims to discover, encourage and honor cinematic works of Filipino filmmakers that boldly articulate and freely interpret the Filipino experience with fresh insight and artistic integrity. Nine films will compete in the New Breed full length feature category; ten in the Short feature category and four in the Directors Showcase. Competing in the New Breed category are: Amok (Amok) by Lawrence Fajardo; Ang Babae sa Septic Tank (The Woman in the Septic Tank) by Marlon Rivera and Chris Martinez; Ang Sayaw ng Dalawang Kaliwang Paa (The Dance of Two Left Feet) by Alemberg Ang and Alvin Yapan; Bahay Bata by Eduardo W. Roy, Jr. and Jerome Zamora; Cuchera by Joseph Israel M. Laban; I-libings: Your Loss, Our Luck (E-funerals) by Rommel Andreo Sales; Ligo na U, Lapit Na Me (Star Crossed Love) by Noel Ferrer, Jerry Gracio and Erick Salud; Nino by Loy Arcenas; and Teoriya (Father’s Way) by Alistaire Christian E. Chan. The ten finalists in the Short Feature category are: Debut by Pamela Llanes Reyes, Every Other Time by Gino M. Santos, Hanapbuhay (Source of Living) by Henry Frejas, Hazard by Mikhail Red, Immanuel by Gabriel “Gio” Puyat, Nino Bonito by Rommel “Milo” Tolentino, Oliver’s Apartment by Misha Balangue, Samarito (Samaritan) by Rafael L. Santos, Un Diutay Mundo (One Small World) by Ana Carlyn V. Lim and Walang Katapusang Kwarto (An Endless Room) by Emerson Reyes. The winner of the Short Feature Category will receive a prize of P100,000.00 and the Balanghai trophy. New sections will spice up this year's Cinemalaya menu. Focus Asia will feature eight independent works by Asian directors from Korea, Thailand, Malaysia, Indonesia, China, Vietnam, Singapore and Japan. The Ronwaldo Reyes Retrospective, presented in cooperation with the Society of Filipino Archivists for Film, will highlight the directorial works of National Artist Fernando Poe Jr., better known to Filipinos as an action star. The Cinemalaya Documentary section, presented in cooperation with Calata Corporation, offers a hefty and more substantial helping of films on various aspects of Philippine life and society. At the CCP, the Festival will be held in seven venues. The opening ceremony is slated on July 15, 6:00 pm followed by the festival opening film at the CCP Main Theater. The Cinemalaya Awards Night will be held on July 24, 7:00 pm at the same venue. Other sections of the Cinemalaya are the NETPAC Philippine Premieres with eight competing films, Ani (a harvest of the best Filipino Indie Films of the past year), Kids Treats (indie films for children) and Midnite Specials (indie films with adult themes). Cinemalaya will also organize the Cinemalaya Film Congress, which will carry the theme Building Bridges Across Asia Through Films, and other film related events such as the Sine Taktakan (forum with 2011 Cinemalaya filmmakers), lectures and exhibits. 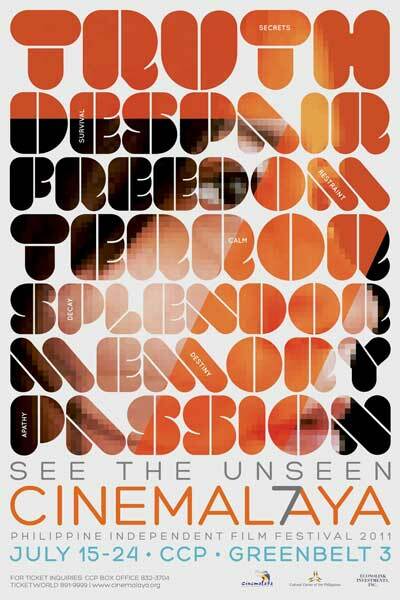 See Cinemalaya Ads here and here. ISDA by Adolfo Alix Jr.
For more info, please call CCP Marketing at 832 1125 locals 1405 or 1800.